When you wear coloured contact lenses for the first time, it is important to know how long you can wear them for. 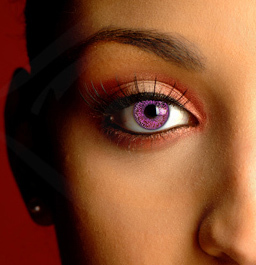 Most coloured contact lenses are not designed to be worn for long periods. If you wear them for longer than recommended you run the risk of discomfort, eye irritation and difficulty when it comes to removing your contact lenses. So how long should you wear them for? Most coloured contact lenses are designed to be worn for up to eight hours at a time. Prescription contact lenses can usually be worn for longer. I recommend wearing your coloured contact lenses for an absolute maximum of eight hours in order to keep your eyes healthy. Obviously there are more than 8 hours in a day, so wear your coloured contacts only for the time when you actually need them. For example, if you are wearing them for a costume party, simply insert your contacts just before the party as opposed to wearing them all day. If you look at the packaging of your coloured contact lenses you will see an expiry date or instruction to discard your lenses after a certain period. Most coloured contact lenses last for either 1 month, 3 months or 1 year. This is the “life span” of that particular contact lens. It means that once you open the lenses, you can wear them as many times as you like within that period. But you must discard your lenses when that time has passed. Contact lens life spans can vary, so always check the packaging or ask when you purchase your lenses. Oops, I wore my contacts for too long! What now? If you accidentally wear your contact lenses for more than 8 hours, it is imperative that you remove your contact lenses immediately. You may find that your eyes are dry or sore, but this should go away if you remove your lenses and give your eyes a chance to recover. Do not wear lenses for at least 48 hours and use eye drops to reduce irritation if necessary. But what if the contact lens is stuck in your eye? This may happen if you wear your contact lenses for too long, due to the lens drying out. The lens can even become stuck under your top eyelid. The best way to remove a stuck contact lens is to rinse your eye with sterile contact lens solution. This will soften the lens and help it to move to the front of your eye. You can then remove it as normal. If you still cannot remove your coloured contact lens, seek the help of a professional. Most opticians will remove a stuck contact lens, even if you are not registered with the practice.